4th wave extensions happen when a 3rd wave completes and we now have a 4th wave of one larger degree that must look for support somewhere– either the top of wave 1 or just below the prior 4th wave support. Of course inside the 3rd wave, there was already a 4th wave. We are talking about the bigger degree 4th wave — so more distance needs to be traveled in order to reach support if we are to test the top of wave 1. In order to get there, we may get extensions. It would be fairly common for the 5 down to happen at the market open– as this is what happened on Thursday March 24, 2016– the day before Good Friday and the 3 day weekend. Notice that in this 4th wave extension, we are aiming for the top of wave 1. Note this could also be top of wave A if labeled with letters. Notice the top of wave 1 was already tested as support on March 22. Support held and we went to new highs. But once new highs were reached at 2046-2047, we needed to go to a 4th wave of one larger degree — and this time test the top of wave (1) at 2012. To go from 2046-2047 to 2012, we can either get there through an A-B-C formation. Or we can go straight there with extensions. 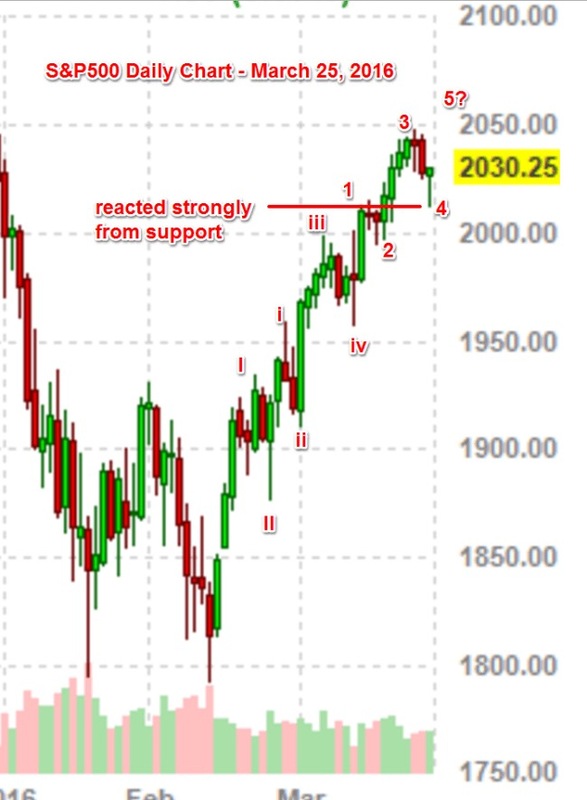 If market responds strongly from this support region, then it’s likely this structure is the correct wave as a 4th wave extension into top of wave 1 support. Do not confuse 4th waves with the beginning of a reversal in direction.